A superb Large Antique Oak 18 Drawer Partners Desk, with identical nine drawer configuration to both front and rear elevations. 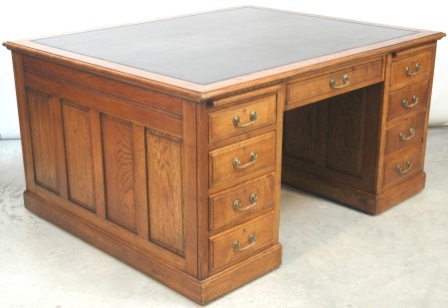 This Partners' Desk dates from the Edwardian period, c1905, and is in excellent condition with its original virtually unmarked black embossed rexine writing surface. The proportions of this large desk are highly sought after and it features two pull out slides to each elevation and also fitted ledger drawers to both elevations making it a most practical work space. Documentation provided with this desk confirms that it was in use in a Solicitors office in the early 1900's. This substantial desk is made from high quality oak throughout and has wonderful panelling to both inside and outside faces of the pedestals. The attractive brass swan neck handles are Edwardian originals and this desk also has original working brass castors and wheels for ease of movement. This is a fine example of an 18 drawer Antique Oak Partners Desk and its overall proportions and golden oak colour make it an impressive and handsome desk from all angles and an excellent example of Antique Edwardian Office Furniture.